Ronald Reagan was born on February 6, 1911, in Tampico, Illinois. He graduated from Eureka College in 1932, and enlisted in the U.S. Army Enlisted Reserve Corps on April 29, 1937, receiving a commission as a 2d Lt in the U.S. Army Officers' Reserve Corps of the Cavalry on May 25, 1937. 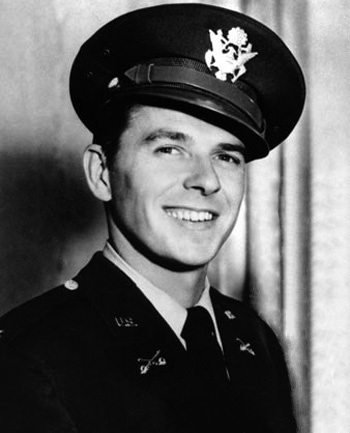 Reagan went on active duty beginning April 19, 1942, and transferred to the Army Air Forces on June 9, 1942. Capt Reagan served with the 1st Motion Picture Unit for most of the war, and he helped produce over 400 training films for Army Air Forces personnel. He left active duty on December 9, 1945, and remained in the Army Officers' Reserve Corps until being discharged on April 1, 1953. After World War II, Reagan resumed his acting career and went on to serve as Governor of California from 1967 to 1975, and President of the United States from January 20, 1981, to January 20, 1989. During his time as President, Reagan ordered the Invasion of Grenada in 1983, military strikes on Libya in 1986, and he helped bring the Cold War to an end. Ronald Reagan died on June 5, 2004, and was buried at the Reagan Presidential Library in Simi Valley, California. On July 12, 2003, the aircraft carrier USS Ronald Reagan (CVN-76) was commissioned, which was the first time an aircraft carrier had been named for a living former President. On January 13, 1993, President George H.W. 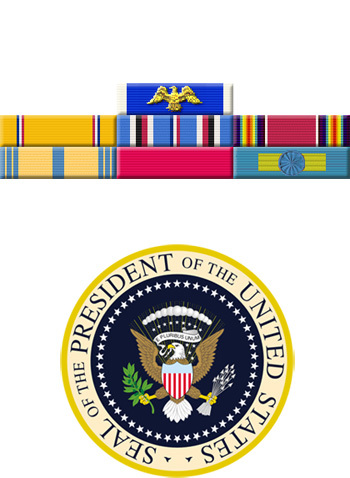 Bush presented the Presidential Medal of Freedom with Distinction to Ronald Reagan. It was only the 3rd such honor bestowed on a former President, and the first time it was awarded to a living former President. Ronald Reagan symbolizes all that is best in America. His is the story of a lifetime committed to individual freedom and liberty. As President, he enabled the American spirit of hope and optimism, faith and family. At home, he championed free enterprise over big government and presided over the longest peacetime economic boom in our Nation's history. Around the world, he burnished America's lamp of liberty so that those living in tyranny might secure freedom against the darkness. His steadfast belief in peace through strength consigned imperial communism to the ashheap of history. Ronald Reagan's courage and convictions changed America, and helped America change the world. America honors a man who has brought her great honor, the 40th President of the United States, Ronald Reagan.